The town of Ardud (German: Erdeed, Hungarian: Erdőd) has 7.000 inhabitants and lies on the edge of the Tisza lowlands in the hilly landscape of the northern Carpathians. First records of Ardud come from the year 1215. Back then, the settlement was the centre of the royal forestry administration. Later, the area was allocated to Satu Mare County. In the 16th century, Ardud became the centre of the dissemination of Calvinism and the Calvinist movement in the region. In the 17th and 18th century, Ardud was destroyed several times by the Ottoman troops because of its important strategic position. Later, during the Kuruc uprisings, it was alternately Kuruc and Austrian property. After the Kuruc Wars and the Peace of Satu Mare (1711), the settlement became the property of Count Sándor Károlyi, who settled the area with Swabians from Württemberg. The colonists filled the gap left by the population who fled from the wars or fell victim to them. The first colonists from Württemberg arrived in 1726. Soon, conflicts with the local population arose which were fought out vehemently. Therefore, the county only allowed the new settlers to leave the village and go to Beltiug. Later settlement waves of Ardud were more successful. The gothic church of Ardud was built in 1482. It was originally a Roman-Catholic church, but came to be Reformists soon after its consecration. In 1545, Hungary’s first Protestant synod was held here. In the course of the 18th century, the church became Roman-Catholic again. 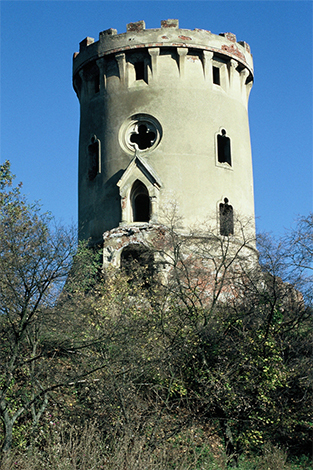 In 1860, it was restored after plans by Miklós Ybl. Ybl was a famous architect of Swabian origin. The most important elements, which were designed by Ybl and built in the 19th century, are the southern nave and the high, neo-gothic tower. An important figure of the town is Tamás Bakócs. He was born in 1442 as a royal notary’s son and came to be bishop of Eszergom, primate of Hungary and cardinal. In 1513, he was one of the aspirants to the papal throne, which went to Giovanni de Medici, Pope Leo X., in the end. 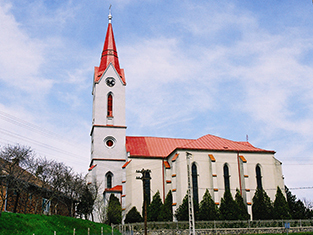 The Catholic church’s neo-gothic tower was designed by architect Miklós Ybl and built in the 19th century. Following old Swabian-Allemanic tradition, Ardud celebrats the first Saturday of carnival with a bonfire. On a field on the edge of the village, all people gather around a big fire. Wooden slabs are held into the fire and later hit against a plank. In old local dialect, the girls then ask: “Schiebi, schiebi, Scheiba, wem soll dea Scheiba sei?” (“For whom is this slab meant?”) A young man then answers: “Die Schwaben aus Erdeed” (“For the Swabians of Ardud”) and throws the glowing disc into the night.